Sahih Muslim Book 020, Hadith Number 4553. From the Above Hadith, without doubt, we understand that Prophet (s.a.w) referring to the last Khalifa before it was abolished in 1925. It is clear that who is on the most authentic path and who is on the tainted paths! Whoever disconnected from Ottomans have tainted paths! Otherwise,have courage to say sahih Muslim Hadith is fabricated! So if you are against Ottomans, against Khalifas, against their way and methods, then you are from somewhere else! And the Hadith explains from where you are and your destiny! Claiming to be just a sunni or ahlu sunna or any other group does not make anyone on right path or on saved sect! The signs and rules of the saved sect is mentioned in various ahadith! You cannot take individual hadith, but the Hadith that speak about end of Times, and lay down the points you will get a clear picture. The Main body of Muslims and their Imam means Muslims and their Khalifa. The last in the line were Ottomans, and even if there is no Kbaifa, still you have to keep the ways of the main body of Muslims and their Imams, the last one in authority on Muslims were Ottomans (as Quran says 4:59), so the last one/closest one for Muslims to follow is the way of Ottomans. If Prophet (s.a.w) ordered his Sahabi (Companion/Salaf) to follow the Imams of the times, then what about you and me, the low level Muslims? 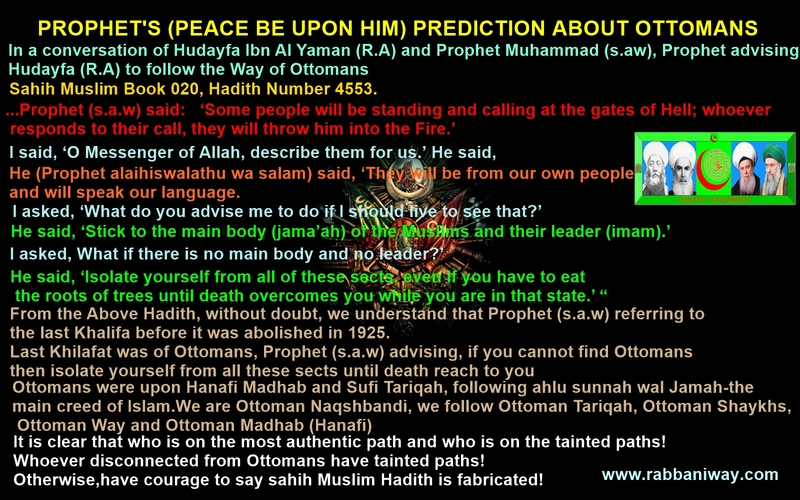 You claim directly follow salaf (sahaba), but Sahaba were ordered to follow the Imams of the times, this is another proof to prove that Wahhabiya/Salafiya is impostors and liars, whom Prophet (s.a.w) referring in the above Hadith, to stay away from! Prophet (s.a.w) was not Iraqi or Irani!, so the message is clear, whoever respond to the call of Wahabiya, will be thrown into hell fire! Since throwing into hell fire is an act of Dajjal in the End of Times (after Khalifa has gone), Wahhabiya is a trap established by Dajjal and his party! But people think and believe that entering in Wahhabiya/salafiya is entering in the way of Salaf! The hadith in bukhari says: people think Dajjal thrown a man into hell, infact he fell into heaven, and those who think Dajjal thrown into heaven actually fell in hell fire! This is very clear for anyone to understand, today Wahhabis are those who accuse shirk and kufr on Muslims!, so people think Muslims are in hell but the wahhabi, Prophet (s.a.w) mentioned in the above Hadith in Sahih Muslim, are the real people who throw others into hell! According to Saudi laws, a non-Muslim cannot enter in Madinah or Makkah! Then how come Munafiq and disbelievers in Madinah, who follow Dajjal? Refer Daniel 7:25 owards, and 2 Thessalonians 2:3-4 on wards! So it will be Wahhabis who will be tricked by Dajjal! Ahlu Sunnah Believe: There is nothing like Allah” refer Sura Ikhlas! But Dajjal have made a Kitab Tawheed to counterfeit Original Kitab Tawheed (Al Quran) to deceive people, whom ALLAH has pre-destined to be deceived! The Ottoman Sultans and Armies, the Main Body which is quoted from Sahih Bukhari and Sahih Muslim, were Hanafis, and Naqshbandi and Qadri Sufis. We can see that Prophet alaihiswalathu wa salam, praising the Ottoman Ahlu Sunnah Wal Jamah and it is this sect and creed Muslims must adhere to! . The false Ahlu Sunna brought this days which is Wahhabis and salafis bringing the heaven of Dajjal, which is in fact Hell! When I say ‘Wahhabi’ it not only mean those who follow the school of Muhammad Ibn Abdul Wahhab Najdi!, but also those who imitate their ideologies and ways! Their signs are , they claim to be the followers of hanbali madhab, and their imitators claim they follow one of the four madhabs, but do not have a Shaykh of Tarbiya, do not have a Shaykh of Tasawwuf, have forgotten the ways of the Ottomans, have disconnected from the Ottomans-the Last Khalifa of Muslims and their Jamath! When all traditional schools emphasize on Fiqh Aqeedha and Tasawwuf or Islam Iman and Ihsan, the deviated paths, the paths that are privatized for the benefits of some corrupted scholars and leaders, they reject some from deen and accept some other from the religion (deen)! Khalifa left the authority does not mean, you abandon him his family and his royal route!, but you uphold them and their traditions until death over come you or live with it until the caliph come back! By saying this, I am only helping you to unlock and remove the tie that Maseeh Dajjal (Anti-Christ) put in your heart and mind! If you accept it is good for you, if you reject what I am inspired to say, then remember that your rejection will do no harm or loss to myself! Truth has distinct from all errors. Quran says: 2:256 There shall be no compulsion in [acceptance of] the religion. The right course has become clear from the wrong. So whoever disbelieves in Taghut and believes in Allah has grasped the most trustworthy handhold with no break in it. And Allah is Hearing and Knowing. so, search for the folk, you will find their leader! ALLAH SAYS: 2:257 Allah is the ally of those who believe. He brings them out from darknesses into the light. And those who disbelieve – their allies are Taghut. They take them out of the light into darknesses. Those are the companions of the Fire; they will abide eternally therein.